Large Comical Jumbo Fake Butcher Knife. Nearly 20-inches Long! 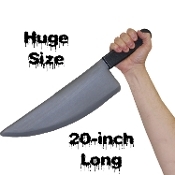 Complete your Halloween killer clown, zombie hunter, or horror movie slasher theme costume this year, with this giant size plastic butcher knife toy haunted house horror prop weapon LARP cosplay accessory. Made from heavy plastic and over-sized for ultimate effect, guaranteed to incite screams!